Sulphuric acid is used in many processes in chemical plants, thus making spent acid quite diluted. Disposing of this spent acid becomes an environmental pollution problem besides a waste of precious resource. The diluted spent acid can be efficiently re-concentrated up to a maximum concentration of 96% (w/w) and reused in the main plant process, thus saving the environment and that too by improving the economical bottom line. Thus, sulphuric acid recovery or concentration plant is a fantastic option for high sulphuric acid users in process plants. 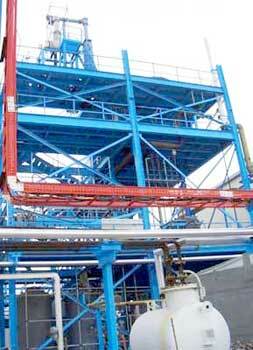 Concentration of Sulphuric acid is mostly performed under vacuum in order to reduce the operating temperature, especially for high concentrations. We offer turnkey solutions right from know-how & technology, to supply, installation & commissioning. Our plant comprises of equipments wherin the wetted parts are made up of Borosilicate glass 3.3, Fluoropolymers (PTFE, PFA, FEP, PVDF, PP, etc), High Nickel alloys, Graphite & exotic metals (Ta, Ti, Nb, etc.). The plants can be totally automated by PLC or DCS based systems and even integrated with computers (SCADA etc). Sulphuric acid is a heavy chemical and finds numerous applications in the industry. It is the product of ‘Contact Process’ and commercially available as 98.5% (w/w) H2SO4 or stronger in the form of oleum. However, many of the processes and applications utilizing sulphuric acid require weaker acid than this. As a result, dilution equipment is often necessary in order to meet the requirement for this weaker acid. During dilution, considerable heat is generated depending on the extent of dilution desired. The Integral heat of solution of sulphuric acid is plotted in fig.1. The heat liberated sometimes is sufficient to produce boiling of the acid and so, provision is made for the re-circulation of a portion of cooled dilute acid, thus ensuring working at controlled temperature. From the above it will be clear that intimate mixing and efficient heat transfer form the pre-requisites for sulphuric acid dilution unit to avoid excessive temperature and local heating and uniform product concentration. Metered quantity of sulphuric acid is introduced to a heat exchanger with re-circulation of water through a pump from the tank containing pre-determinant quantity of water. The turbulence created in the heat exchanger ensures both intimate mixing and efficient heat transfer. When desired strength of acid is reached, the contents of the tank are transferred to storage and fresh batch can be started again.